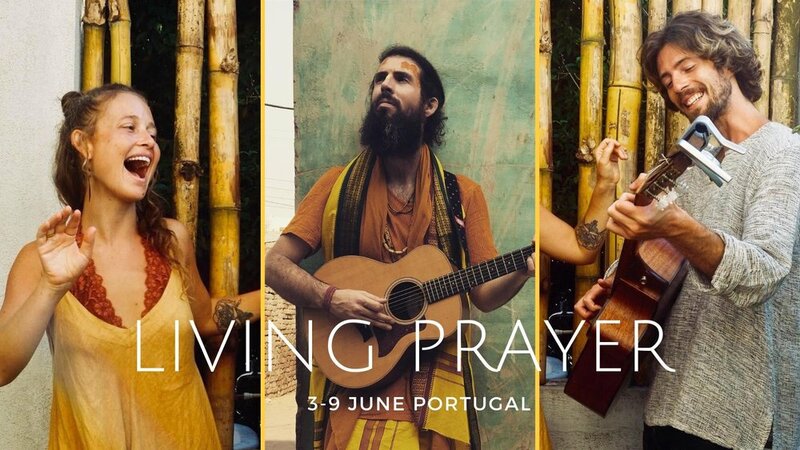 Join the Hanuman Project, Mollie Mendoza (UnMind) & Sam Garrett for a week of inspiration and transformation in Portugal. We are delighted to announce this magical collaboration, carefully curated to support your journey of unwinding, activating and connecting. Situated within easy access of Lisbon, Portugal we are honoured to open the doors for the first ever “Living Prayer”. Extending a warm invitation to explore devotional culture, sacred song and ritual. We’ll be holding space for you to relax into your highest creative potential, supported by an in house plant-based chef, daily movement practice and an idyllic location. This is a retreat for anyone ready to live life more fully, express their creativity and dive into their hearts desires. Expect Kirtan, Medicine Songs, Mayan Cacao, Voice Expansion (Yoga of Sound and Chocolate), Daily Asana and Creative play space. When we gather in community with those ready to support, reflect and encourage our heart’s opening, amazing things happen. As such we are anticipating a very special group of people to gather for ‘Living Prayer’, we will be opening for applications on Feb 6th and look forward to hearing from you all! Secure your place with a successful application, (opening on the 6th February). Once this is accepted we will email you with a deposit payment, we cannot wait to celebrate, sing and play with you all! There are 4 super early bird price spots available for the first applications accepted! The Shanti Space is a sanctuary for personal development and empowerment; a space to rest and restore well-being whilst bathed in abundant nature. The venue, an old Quinta set in a national park and is endowed with beautiful fruit trees, giant oak corks, grape vines, vistas and a stream at the end of the garden where we often encounter our neighbours; deer and wild boar. Here is a link to the location on google maps for those interested! We will gather at the Shanti Space to share our first meal together and open our container at 4pm on the 3rd, please ensure your flight lands by 3:00pm so everyone arrives at the space together. Lisbon is an incredible city, if you have the time to arrive earlier in the day or even a few nights before then we encourage some time to explore the amazing food, culture and beaches! At the moment flights are VERY cheap from Europe to Lisbon, grab these quickly! If coming from the UK on the day of retreat we recommend the 11:55 from Stanstead arriving in Lisbon at 14:45pm. More information regarding arriving at the space will be sent on successful application. in 2018 the Hanuman Project recorded their Kirtan album ‘Thank You For Choosing This Reality’ in Los Angeles California. Another E.P. of Medicine Songs is also in production alongside Organic artist ‘Mose’ to be released on Resueno records in 2019. In 2015 Patita Pavan co-founded the ‘Yoga of Sound & Chocolate’ transformational retreat programme, a deeply held container for personal growth, voice expansion and creative exploration. This programme has supported many participants every year in releasing trauma around vocal expression and creative blocks, and becoming familiar in a range of practices including, nada (voice) yoga, cacao ceremony, sacred song, sound healing. Yoga of Sound and Chocolate mixes radical experiential and participatatory learning methodology; deeply safe space to experiment outside comfort zones; full heartcentered presence allowing authenticity, vulnerability and healing. Sam Garrett is a musician whose journey has led him to use sound as a way to inspire healing and spark curiosity. Lyrically soulful, and devotionally talented, he harnesses the power of words, messages and melodies to enliven our exploration into openeness and love of life. Inspiration comes in many shapes and forms, and for Ryan ‘Narayan’ Nadlonek, much of his musical aesthetic is inspired by his experiences with nature and the beautiful people he has met along his life’s journey. As a musician and yogi, Narayan brings spirituality into all aspects of his life. He began practicing yoga in 2005 while living a surfing lifestyle in Hawaii. The holistic benefits were immediately realized and his yoga practice deepened, leading him to Bhakti Yoga and the practice of kirtan. He followed the seeds of inspiration to find his asana teacher, Shiva Rea, and his devotional sangha, the Gaudiya Vaishnavs. Narayan has been studying piano and drums from an early age, and brings his diverse musical skills into the practice of kirtan. Currently, he performs with The Hanuman Project, in which he plays percussion and produces electronic beats. Also influencing his music and practice is his love for ecstatic dance, contact dance, breakdance, and Shaolin Kung Fu. Narayan has collaborated with many talented and popular kirtan artists including The Kirtaniyas, Govindas and Radha, Sita Devi, Shaman’s Dream, Saul David Raye, DJ Drez, Jim Beckwith and David Newman. The first four applications accepted will receive a 10% discount off their chosen accommodation in this beautiful space. You will receive an email with deposit (£300) payment details once we have received and confirmed your application, you are also welcome to pay the full amount at this time. We recommend booking your flights soon as they are very cheap at the moment!